Whew, time does fly! The latest edition of Paper Crafters Sampler e-magazine is out! Actually, it has been out for 8 days, now. (Sorry about the delay in notice.) As you may know, and if not sorry about the assumption, but I am a monthly contributor to this very creative and inspiring e-magazine. This publication is available monthly, and is an electronic format. So, you can't purchase a 'hard copy' at a store, but you can purchase an e-copy, and print it, to have a 'hard copy'. 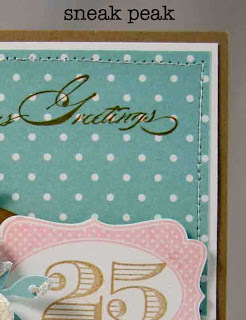 This months publication has Christmas paper crafts (cards and 3-D items) that you can create with current Stampin' Up! supplies! Each craft has a complete instruction sheet, along with a list of supplies used for each project. How super wonderful is that? This is a great 'tool' if you are a Stampin' Up! demonstrator, and you need some creative, new classes. Or you are a Stampin' Up! loyal customer/hobbist. Here is a sneak peek at the Christmas Card I created! This publication contains projects with a variety of styles, and wonderfully creative projects! Purchase your today @ Paper Crafters Sampler for $12.99. Don't forget to check out the other sneak peeks. You will be inspired!